Einstein showed that there is an equivalence between matter and energy (E=mc^2), but what does that really mean? Personally, I’m kinda stumped when it comes to understanding energy, and I suspect that many other people are too if they think about it. Then there’s that pesky c^2 part of the equation, which seems even more nebulous. Physics 101 tells us that c is the velocity at which light (a form of energy) travels, and that any velocity squared is acceleration. Also we learn that velocity is distance over time. But now we have even more to ponder because distance is a measure of something called space — anyone got a good definition of that? And time, well, you don’t have to be Einstein to know how relative that can be. The most difficult part of challenging our assumptions is knowing that we are making assumptions in the first place. Certain assumptions are so ingrained in the culture that they have become metaphysical. That is, they transcend the realm of something we can inquire about and are unintentionally exalted as part of the very nature of reality. In the Western scientific tradition, matter — that is to say material stuff — has been the primary metaphysical assumption since The Enlightenment. But this hasn’t always been so, even in the West; go back and read Plato and Aristotle if you don’t believe me. Furthermore, even today there are thriving societies, economic powerhouses, which have a different relationship to matter and don’t necessarily view it as fundamental. Until recently physicists scoffed at anyone who deigned to suggest that there was anything in the universe except matter and energy. Space and time were not really thought of as existing “in” the universe so much as defining the boundaries of it. In other words, there is no universally accepted equation that transforms matter into time, and no agreement on how many dimensions (spatial or otherwise) there ultimately are. But I’d like to point out a metaphysical shift that has occurred in the last 30 years or so, coinciding — not so coincidentally I suspect — with the rise of computer technology. And that is the notion that information is fundamental. That the universe is a giant computer and that all the matter and energy we see around us is somehow an artifact of this universal computation. Now I bring this up not because I believe an informational metaphysics is superior or more true than a material one, but rather to illustrate the cultural relativity of what you might perceive to be self-evident. Because if you received a university education in the U.S. it is very likely that you were not taught to believe information is somehow more fundamental than, say, a photon or an electromagnetic wave. It’s easy for most of us “educated” types to see how information can arise out of matter/energy, but not the other way around. In the end, whatever metaphysics you adhere to defines the rules of rational inquiry you follow when seeking higher truth. The physical sciences don’t just depend on materialism, they derive from it. Without the notion of a fundamental particle, there would have been no chemistry, no physics. And as any philosopher of science will attest, these two sciences have indelibly shaped inquiry in all of the biological and social sciences as well. The ultimate validity of any metaphysics — and any scientific models derived from it — is determined by how well it serves us in understanding the world around us, predicting the future we will find ourselves in, and also creating the world we want to find ourselves in. So it is worth examining whether our metaphysical assumptions are serving those purposes from time to time, especially when we find ourselves faced with existential challenges, as we seem to be with greater frequency these days. Of course the difficulty with metaphysical mind-shift is that our very minds have been shaped by the metaphysics of our culture. It’s not so easy to try alternative metaphysics on like they were a new pair of jeans. If I asked you to accept, for instance, that information was fundamental, and then asked you to derive matter and energy from it, would you know even where to start? Or perhaps information alone isn’t enough, maybe you need to add consciousness. Or maybe the breakthroughs we are looking for will come if we demote the physical and begin with life-itself, as my friends at the Autognomics Institute have done. While I don’t really understand it all myself, I’m trying it on as my metaphysics for 2010 and seeing what happens. A couple of things that are implied by the relationships I will point out. 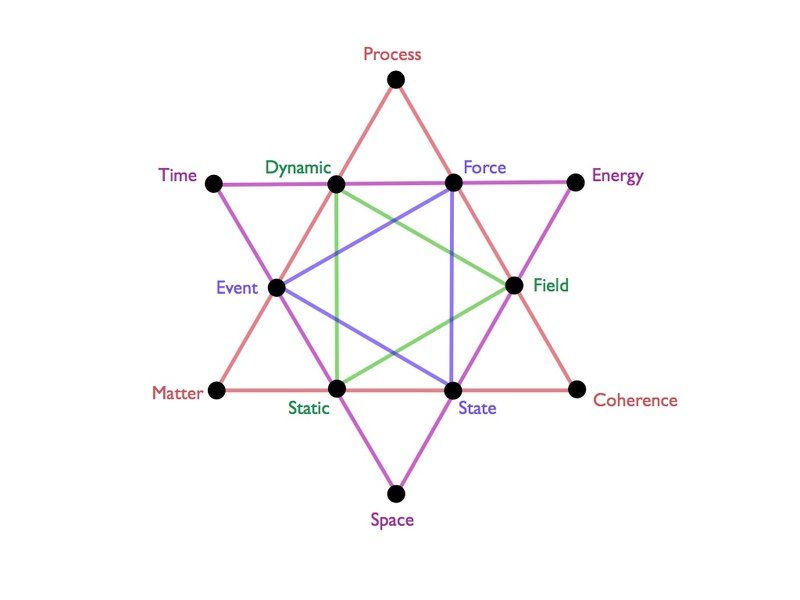 One is that it is composed of single-color triangles, any one of which can be used as a metaphysics by itself (I guess that makes the whole diagram a metametaphysics, but that’s a separate story). My theory is that, in Pythagorean fashion, if you start with any two vertices you can derive the third. For example, on the purple triangle, if you know enough about the nature of space and energy, you can derive what time is. Another implication is that concepts close to one another on the diagram are close semantically (e.g. time and event). A corollary of this proximity is that opposing vertices are dualisms, like matter and energy, or dynamic and state. I realize that thinking in these terms is awkward, but I’m trying to suspend my linguistic and logical predispositions just enough to grok the physical consequences of these metaphysical axioms. I’ll let you know if anything comes of it, and hopefully you will tell me if you have any metaphysical insights of your own. Velocity squared is not acceleration, there's an extra distance term in velocity squared. Context may seem critical and if the metaphor is not fully representative (when is it ever?! ), then some may think the argument is flawed, which it's not. However, without context, we don't have any common ground to play the language games. :) Velocity, shmelocity. times pi. If anything, that just illustrates the point. We get lost in translation. But that's all we ever do. On Metaphysics. I think it's a bit like Trinity falling off the building and Neo having to choose between Zion and her. There's a reason why Trinity didn't have the traditional appealing hollywood image. It's up to you to discover pain, dig in deeper, and resolve it. and it's up to you to fall in love at some point. aaaaaand repeat. 125 times or so i hear. Thanks for reading carefully enough to point out the error! I want to ask you about Metaphysic ? What is Metaphysic ? There's no problem with time being relative in E=mc^2. Recall that the whole point is that the velocity of light is _not_ relative. I agree there is no problem in the sense that consistency is kept. What it means though is that we need to rethink our deep-seated notions of space and time. And with quantum entanglement and the double slit experiments, we really have to question their very existence, even in non-quantum realms and at non-relativistic speeds. I'd say the more parsimonious explanation is many worlds. Time and space exist, they just branch a lot. But this almost certainly counts as rethinking. I'm working on a post that generally fits in with your metaphysics thinking based on my latest physics read. I'm working on a unification post of sorts as well, it will interesting to compare/converge! Yes, this is true, and well put. If the fundamental reality is in the observer, then the Copenhagen interpretation is correct. If the fundamental reality is the whole universe with no observer, then the universal wavefunction idea (a variant of many worlds) is correct. The best resolution is not to assume that fundamental reality lies anywhere. “Reality” can only be captured through exchanges of information.